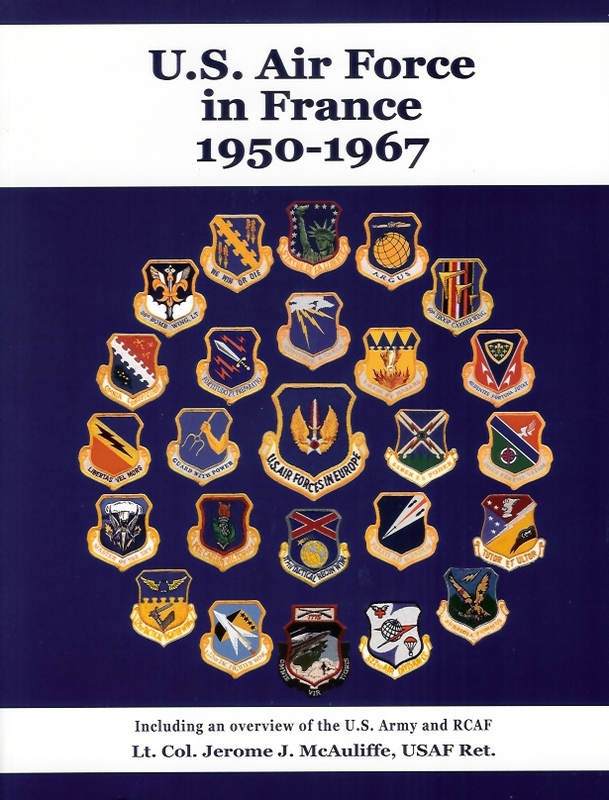 This 464 page book is an excellent history of the U.S Air Forces in France from 1950-1967. Copies are $34.95 plus $3.50 for shipping. You may order from "Milspec Press, 2522 Cowley Wan, San Diego, CA 92110 or e-mail milspecpress@aol.com or contact the author at jeromencauliffe@aol.com. Tele: 619-275-0229 ir 619-276-4227. Web site: http://home.san.rr.com/usafinfrance This documentary contains a great chapter on Chambley and the 21st Fighter Bomber Wing. A must for your library. GOVERNMENTAL AGREEMENTS - The beginning. from the files of Colonel George N. Stokes. A. 16 February 1948: The United States and French governments signed a Civil Affairs Agreement that permitted the deployment of US forces in France. B. 27 February 1951: US and French officials signed an agreement for establishment of a USAF depot at Chateauroux AB, France. C. 00 February 1952: The French government approved a US request to build eight base and support facilities in France at Evreux, Phalsburg, Chambley, Chaumont, Laon, Toul, Druex and Etain. D. 04 October 1952: The US Air Force and the government of France signed an agreement that placed several French air bases and facilities at the disposition of the US Air Force. These included Chalons, Chambley, Chaumont, Chenevieres, Dreux/Louvillier, Etain/Rouves, Evreux-Fauville, Laon/Couvron, Phalsbourg/Bourscheid, Toul-Rosiers, Nantes area, Vitry/Brienne area and Cherbourg area. Captain George N. Stokes, Sr.
As Commander of the 21st Fighter Bomber Wing, I extend to all my very best wishes for a Merry Christmas and a Happy and successful New Year. Christmas is a day of many happy memories. A day that we like to spend at home with our loved ones, and since it is a day of giving by our gifts, we bring happiness to ourselves and our families. For Service personnel, home is wherever their current assignment takes them and their Christmas celebration will vary according to existing conditions. For most of us, Christmas 1954 was bleak and a dreary day far from home and loved ones. Many of you were fighting the mud and rain of Chambley; others of us were stranded at various bases along the North Atlantic ferry route. Christmas 1955 presents a pleasant contrast and brighter outlook due to the progress made during the past year. Your cooperative effort these past months have not only bettered living conditions to a marked degree, but has also carried out the Wing's primary mission. These factors are borne out by the many honors and other recognition which the 21st has achieved this year. The 21st Fighter Bomber Wing has reason to be proud of its accomplishments during 1955. With a continuing spirit of cooperation and a united effort, 1956 can be an even better year. A bessed Christmas and Prospercus New Year to all personnel of Chambley Air Base, your dependents and loved ones.